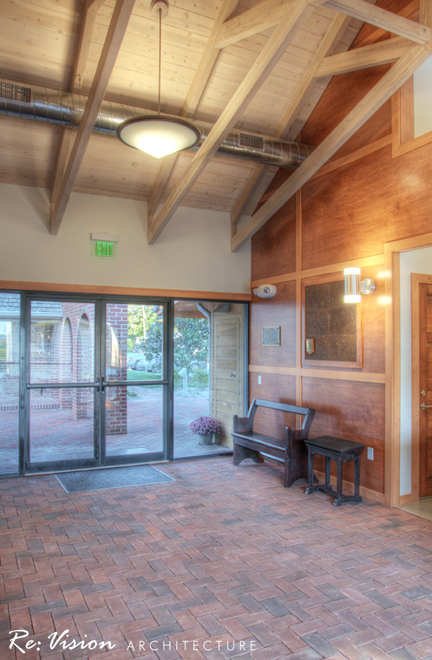 The Camden Friends Meeting and Social Hall sits adjacent an historic 1805 Meeting House and serves the congregation as a community gathering space designed to complement the elegant simplicity and durability of the historic Meeting House. 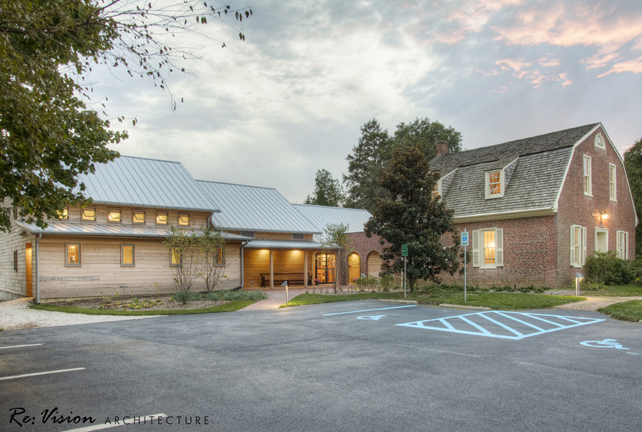 Spaces within the multi-function annex include a large social hall, catering kitchen, archival display, community outreach rooms, and restroom facilities. 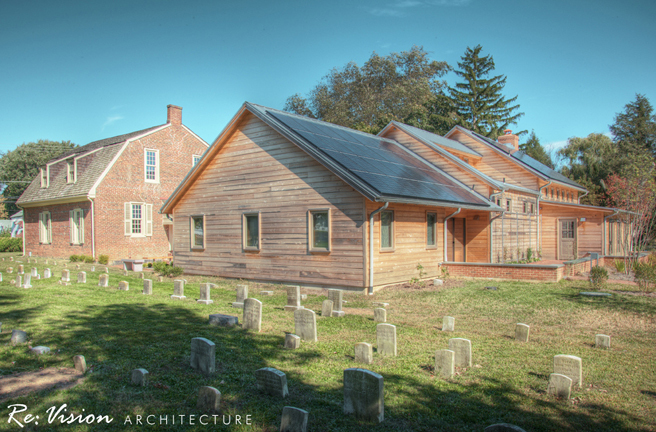 To preserve the Meeting House as the crown jewel of the site, the new annex roofline steps down in a gesture of humility; lowering as it approaches the historic meeting house and outdoor worship space. A glass core at the main entrance to the annex allows visitors to see through the new annex to the historic Meeting House when approaching the building from the rear parking lot. 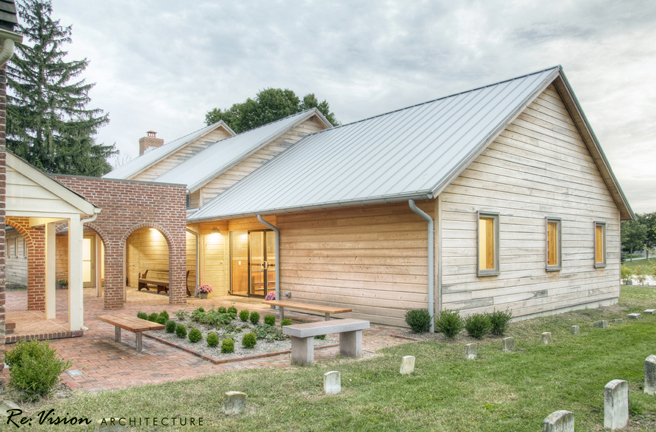 The clean lines of the annex, which was clad with a rain screen of salvaged cypress, and metal roof, allow the Annex to float behind the historic meeting house without upstaging it. The building’s form and layout are designed to take advantage of passive heating, cooling, and lighting. 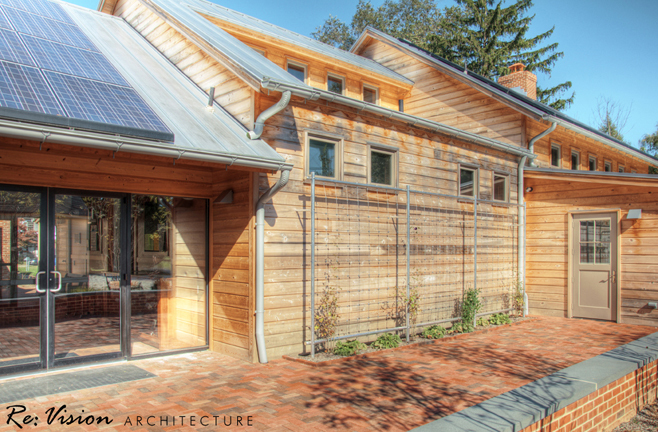 This passive design includes a tightly sealed thermal envelope with superior insulation. The exterior wall construction is of 2x6 wood studs, bio based foam insulation, with an additional layer of insulation applied to the exterior sheathing. A rain screen keeps the water on the outside of the building and reduces the risk of condensation on the interior. 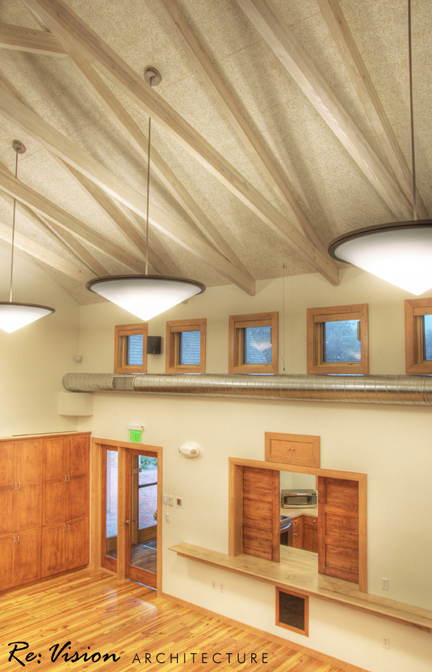 The roof is constructed of structurally insulated panels (SIPS) with an average R value of 48. Through careful design and detailing, the building starts with a low energy load. 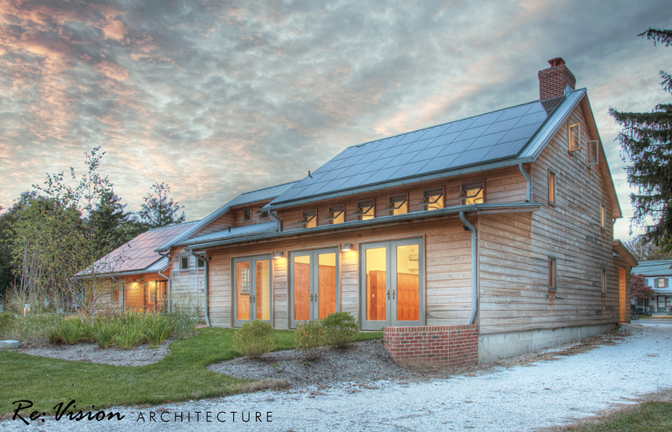 Supplemental heat is provided by a closed-loop ground source heat pump system and power by a 12Kw photovoltaic array. After the first year, the new building’s solar collectors generated almost enough energy for both buildings, leaving only 188 kW provided by the local utility company for the entire complex. If the social hall was left to power itself, it would provide 150% of the power it consumed, making it a net positive building. Equally exciting, the building exceeded its predicted energy model in both energy reduction as well as water consumption through careful operations. In terms of water, a 2,000 gallon cistern collects rainwater and stores if for use in flushing toilets and irrigation. 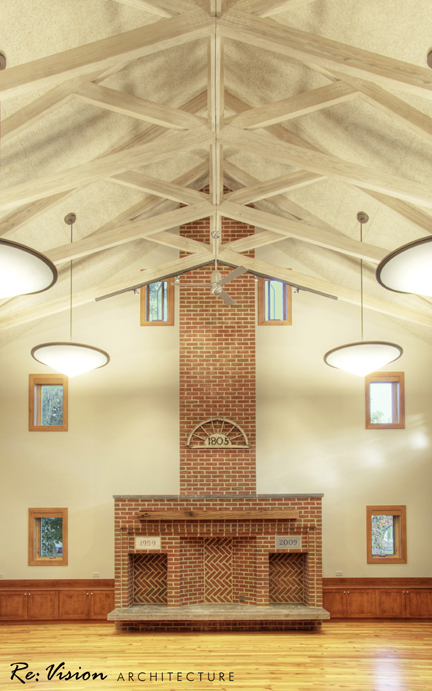 By design, the building is intended to have the warmth and comfort of a home. At the same time, it needs to stand up to the intensive use that comes from accommodating large groups. In this way, the building straddles the residential and commercial sectors. 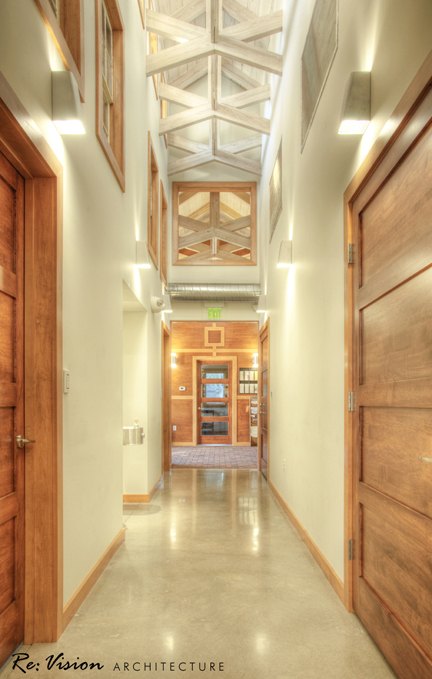 While the 2,864 sf building is institutional in its use, its materiality, systems, and construction methods are all applicable on both the residential and commercial scale. Camden shows that net-positive buildings are feasible for homeowners, businesses, and non-profits who have this goal. 2x6 wood studs, bio based foam insulation, with an additional layer of insulation applied to the exterior sheathing. A rain screen keeps the water on the outside of the building and reduces the risk of condensation on the interior. The social hall (new construction) is adjacent to the historic meeting house. It produces almost enough energy for both buildings, let alone for itself. The design team paid attention to the orientation of every window, placing very few windows on the east and west sides of the building and placing more on the south side. 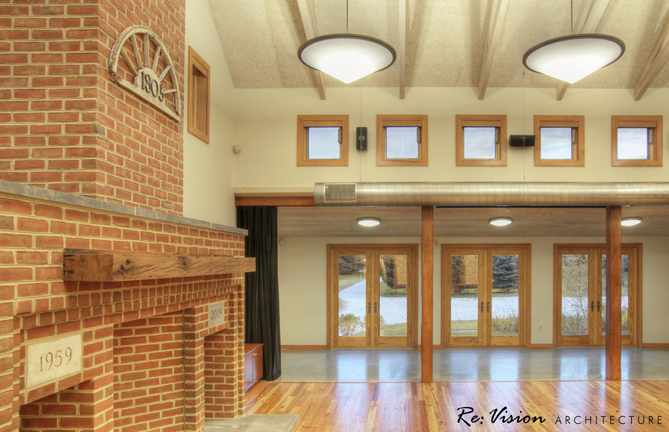 The south side of the Social Hall is 30% glazed, which takes advantage of solar gain while minimizing glare. The design team conducted a multi-day design charrette onsite where they invited members of the Camden Meeting and other community stakeholders to provide their input. This was moderated by trained facilitators. Integration between the architect and the engineer continued with combined meetings at the Re:Vision Architecture office. The original program asked for a display room and a separate classroom but by combining uses, the team realized that it could drastically reduce the building footprint. The team decided the social hall lobby could be used as a display room and the second floor of the historic Meeting House could be used as a classroom. A total of 750 square feet were cut from the original program, allowing the new building to be optimally oriented towards the south without intruding on the graveyard or entrance drive.